2 Summer Olympic Cities Are Chasing The 2022 Winter Games : The Two-Way Beijing and Stockholm, Sweden, are vying to become the first city to have hosted both summer and winter Olympics. They're among six cities that submitted bids by Thursday's deadline. What's a few palm trees? 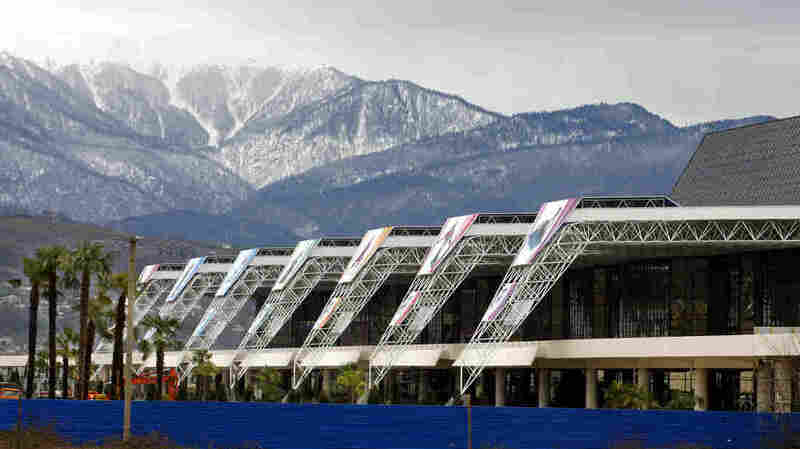 Soaring snowcapped peaks and the aforementioned palms rise near the airport in Sochi, Russia, host of the 2014 Winter Games. Summer Olympics hosts Beijing and Stockholm are among the cities vying to win the 2022 Winter Games. With the upcoming Winter Olympics set in a subtropical, palm tree-lined resort city on Russia's Black Sea, it's no surprise that two former Summer Olympics hosts are now seeking the 2022 Winter Games. Beijing, host of the 2008 Summer Games, must miss the Olympic glow — or polluting murky mist, as it turned out to be, given its formal bid for the 2022 Winter Olympics. China's capital city is among six Asian and European cities that submitting bids by Thursday's deadline, according to the International Olympic Committee. Stockholm, Sweden, which put on the 1912 Summer Games, joins Beijing in trying to become the first city to have hosted both summer and winter Olympics. Beijing's bid has the skiing and sliding competition about 90 miles away in Zhangjiakou. That's about as far as the IOC likes to go when host cities separate the arenas for indoor ice events from the slopes for snow and mountain-dependent outdoor events. But a bigger hurdle for Beijing may be the fact that Asia will have already hosted the two preceding Olympics: the 2018 Winter Olympics in Pyeongchang, South Korea, and the 2020 Summer Games in Tokyo. The IOC tends to rotate the games among continents. Stockholm is taking a major risk with a bid that sends some alpine skiing events more than 400 miles away to the Swedish resort of Are. That seven-hour drive presents an enormous logistical challenge for spectators, journalists and corporate sponsors who need or want to attend multiple events and face shelling out for expensive Olympic housing in two different locations. IOC President Thomas Bach says he's "delighted" that twice as many cities submitted initial bids for 2022 than the 2018 Winter Games. "These cities and their supporters clearly understand the benefits that hosting the Games can have and the long lasting legacy that a Games can bring to a region," Bach said in a statement. The only remaining bidding city with Winter Olympic experience is Oslo, Norway, which hosted the 1952 games. Two cities dropped out of the running before Thursday's deadline. Munich ditched its bid after voters in Bavaria rejected the Olympics in a referendum Sunday. In March, voters in the St. Moritz region of Switzerland decided against seeking a third Winter Games there. The IOC refers to the six 2022 Olympics hopefuls as "a strong mix of both traditional and developing winter sports markets." No American city submitted a bid. The U.S. Olympic Committee decides when and which American cities will bid for the Olympics, and USOC officials have been busy trying to repair a broken relationship with the IOC. They've made significant progress by resolving a nagging revenue-sharing dispute and by involving American Olympic officials in key IOC and Olympic sport groups and initiatives. Olympic boosters in Boston, Los Angeles, Dallas and Washington, D.C., are among those who have signaled interest in bidding for the 2024 Summer Games. USOC Chairman and IOC member Larry Probst told The Associated Press in September that the "first step is we have to decide that we are going to move forward and we have to go through a process of which city gives us the best chance." Outlines of each of the bids for 2022 are due in March, and the IOC will announce in July which of the six cities will make it to the advanced bidding stage. The final choice will be made in July 2015. The IOC gives Olympic host cities seven years to prepare for the games. Gian-Franco Kasper, president of the International Ski Federation, gave the independent Olympic news service Around the Rings an initial assessment of the field. "In principle, I believe that all six have the possibility to do it with some adaptions perhaps," Kasper said.